If you’ve already watched the live action version of Disney’s Beauty and The Beast, I wonder what which team do you belong to? Are you Team Disney, who thinks that this film is awesome because of how it followed closely to the 1991 animated classic, and even addressed the several loopholes, or are you Team Cynic who felt that the close resemblance made the $160M high budget remake film unnecessary? The details. The grandeur. The movie is (almost) like how I wish Harry Potter movies were. The details of the castle, of the provincial town, the attention paid to the costumes, and the make-up when the household return to their human form again showed how much effort was put into the intricate details. When the castle come alive, it felt like magic and not CGI. Surprisingly, the household characters – candelabra (Ewan McGregor), the clock (Ian McKellen), the teapot (Emma Thompson), the cup (Nathan Mack), the wardrobe (Audra McDonald), and the harpsichord (Stanley Tucci) were my favourite part of the film. Emma Thompson’s version of “Beauty and the Beast” was waay better than Ariana Grande & John Legend’s version. I won’t say Emma Watson didn’t do a good job as Belle, because in many ways, she felt like Belle. There were moments when I got confused whether it was Hermione Granger or Emma Watson or Belle on screen. Gaston (Luke Evans), on the other hand, emit a realistic sense of someone who couldn’t control his anger, a more realistic portrayal of the narcissistic animated character. Josh Gad’s Lefou was a delightful contrast from Gaston. 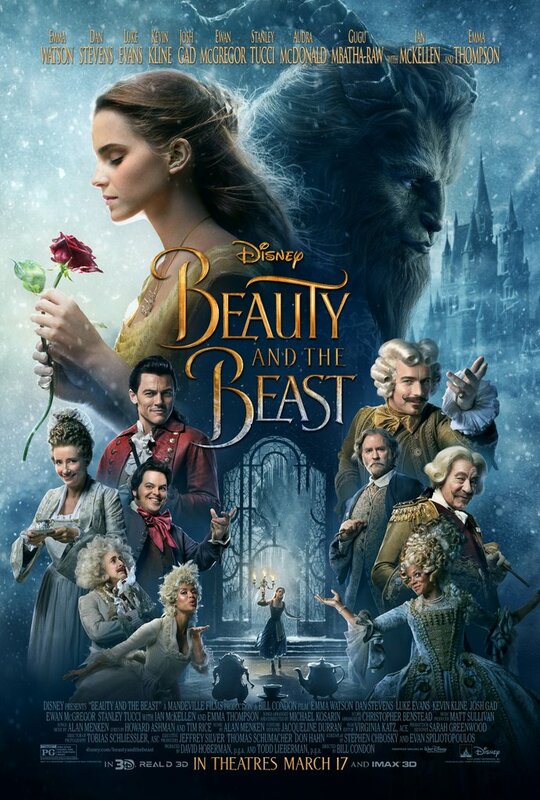 The Beast was more memorable as a beast than the prince (sadly), but this movie will definitely bring back nostalgic moments even if you have little memories of the animated classic. Ryan Gosling was offered the role of the Beast, but turned it down to appear in La La Land (2016) instead. Emma Watson was offered the lead role in that film, but turned down that film to star in this one. When director Bill Condon first spoke to Disney about adapting Beauty and the Beast (1991), they actually weren’t sure they were going to do this new version as a musical. Condon said, “With all due respect, I think you’re crazy. The songs are too good. You’re going to spend all this time making a huge, gorgeous live-action “Beauty and the Beast” and not do ‘Be Our Guest’?” Bill Condon had actors sing The Lion King (1994)’s “Hakuna Matata” at the auditions to measure their singing voices. This was how he chose the final cast for this film. Sir Ian McKellen originally turned down the voice of Cogsworth in the original Beauty and the Beast (1991). Ewan McGregor performed Lumiere’s dances in motion-capture. However, he was embarrassed at wearing the motion-capture suit, and couldn’t dance properly, unless he was completely alone with the filming crew. The hardest part about playing Lumiere was getting the character’s French accent right, although his wife of twenty years is in fact French. He said his voice ended up sounding Mexican instead of French, so he had to redo his dialogue after filming had completed. Emma Watson (Belle), Emma Thompson (Mrs. Potts), Luke Evans’ (Gaston) and Nathan Mack’ (Chip) all share the same birthday, April 15, which was also the date of the first cast read through. Alan Menken, who scored Beauty and the Beast (1991), returns to score this live-action adaptation, which includes new recordings of the original songs in addition to new songs written by Menken and Tim Rice. Luke Evans (Gaston) had to wear fake teeth during filming due to having canines that are longer than normal, which he said would have made Gaston look like a vampire. Interestingly, he did in fact play a vampire in 2014’s Dracula Untold as the title character. The Beast was originally going to be created by having Dan Stevens in prosthetic make-up, designed and created by husband and wife team Dave and Lou Elsey. During post-production, a change was made to recreate the Beast face with CGI, altering the look of the Beast. The final Beast that will be seen in the film, will be Dan Stevens in the full body suit created by the Elseys, but with a digital face, despite Bill Condon’s wish to have the Beast be a completely practical make-up creation. During the ballroom scene, Emma Watson had a hard time not looking at her feet, because Dan Stevens was wearing steel toed shoes, and she was afraid he would step on her. During Belle and Beast’s waltz, the letters WD can be seen in the coat of arms design on the floor. This is a nod to Walt Disney. Check out Disney’s Beauty and the Beast Movie Official Website and Facebook Page! Disney’s Beauty and the Beast Movie is out in cinemas on 16 March 2017. I haven’t watched Beauty and the Beast movie. But I have heard many good reviews about it. My colleagues said the movie followed everything on the book which I think is good. I’m not a very big fan of the story! But I am a fan of disney films and I love to look at amazing CGI! So I guess I should catch this movie. They did a great job on the movie. It feels and looks like the classic animated movie. As always, the story encourages viewers to look beyond the superficial and to be compassionate, curious, humble, and generous. I watched B and the B with my whole family and we all enjoyed everything about it. I really liked the new songs a lot, especially Beast’s solo song “Evermore”. I really laughed aloud with Ewan Mc Gregor’s corny dance moves in Be Our Guest — really hilarious! Great review. I played a feather-duster role in our high school Beauty and the Beast play, and so for this reason I was excited when I heard WD is going to make a film. I think the film is great.